Published on Friday, March 23, 2018. This article appears in the February/March 2018 issue of American Craft Magazine. Originally a railroad town, Roanoke, Virginia, has reinvented itself in recent years. Today the city touts its hiking and biking – some of the country’s best – and its burgeoning craft scene. Nestled in the verdant valley between the Blue Ridge and Allegheny mountains, Roanoke, Virginia, might be best toured by motorcycle. Allow yourself the luxury of exploring the roads that twist up and down the lush mountains before making your way downtown. Once you arrive, stay awhile to get to know the people who call this city of 100,000 home. Though the hiking, biking, and other outdoor activities might be what lures you to the area, it’s Roanoke’s charming artisans who will make you want to linger. Ask contractor Robert Kulp and former yacht captain Mike Whiteside how they founded their thriving business, Black Dog Salvage, and you’ll get an amusingly candid answer. It all started when a historic Roanoke home was facing demolition. The duo hated to see its beauty lost forever, so they went in and saved all the architectural elements they could. They didn’t have much of a plan beyond that. “We had a forklift; I had some equipment,” Kulp says. “I had a truck,” Whiteside chimes in. “That’s an architectural salvage starter kit,” Whiteside jokes. Not many business owners succeed with such an improvised plan, but Whiteside and Kulp have made it work ever since they hung that first sign back in 1999. Now the Black Dog warehouse, workshop, and gift shop occupy about 40,000 square feet just outside of downtown Roanoke. There, the duo sell what they call “raw architectural salvage” such as beams, stained glass, and fireplace mantels they gather from across the US, as well as imaginatively upcycled pieces that their team makes on-site: Doors turn into tables, wine barrels become sinks, and stair balusters frame daybeds. There’s also the signature line of paint their team helped develop to cover pretty much any material, including glass, metal, wood, and ceramic. They sell funky work by local printmakers, potters, and creative upcyclers. And then, of course, there’s Salvage Dawgs, their TV show on the DIY network, which documents their escapades. It’s a lot of business to run, but Kulp and Whiteside have made it a family affair. Whiteside’s son, Tay, has been helping out at Black Dog since he was 12; now 24, he joins them on the small screen, helping to rescue treasures from properties at the 11th hour, and serves as the custom fabrication engineer back at the shop. The rest of the crew, such as salvager Grayson Goldsmith and custom design center production manager Jeff Ellis, may not be family by blood, but they are a vital part of the close-knit team. Even if that were so, the Black Dog founders are lucky enough to have the Blue Ridge mountains to play in once the workday is done. Head north of Roanoke into the George Washington and Jefferson National Forests and you’ll find yourself in the heart of the Appalachians. There, heritage craftsman Kevin Riddle works on his great-grandfather's land in the same workshop his father built, plus another he constructed, making wooden pitchforks, ox yokes, and furniture – as well as copper pans, washtubs, and apple butter kettles – all using traditional Appalachian techniques. He’s spent more than 20 years learning his skills from books and a network of 75- to 80-year-old craftsmen living nearby – “the old guys,” he affectionately calls them – who specialize in different trades. As much as he can, he’s been writing it all down for posterity. “I’ll get on the phone for an hour and ask [a neighbor], ‘Well, how do you do this? How do you do that?’ Because I know it’s going to be lost. I’m just trying to absorb as much as I can and make notes,” Riddle says. That includes gathering wood from his property for his wares; he keeps pieces “green” (soft) in a pond out back. (Though he doesn’t always use wood from his property, he does use all local lumber.) It’s a lot of work, but for Riddle, it’s a lot of fun, too. “I have never made a great amount of money, but this is what I like,” he says. The best view of downtown Roanoke is atop Mill Mountain, where the neon Roanoke Star, which stands more than 88 feet, shines on the valley below. After taking in the vista, adventurous craft enthusiasts can mountain-bike their way down to Black Dog Salvage, home of Roanoke’s other stars, the team of TV’s Salvage Dawgs. Plan to spend a few hours in the sprawling warehouse and gift shop filled with architectural salvage items and offbeat upcycled wares. From there, head a few minutes west to downtown. The Taubman Museum of Art, with its Randall Stout-designed roofline inspired by the Blue Ridge Mountains, hosts an array of exhibitions, including “Farther,” a show of metal sculpture by renowned artist Paul Villinski. Nearby, Calhoun & Kipp boutique sells glass, metal, and wood art by local, national, and international makers. Find sculpture and furniture by John Wilson at Wilson Hughes Gallery, which he runs with wife Suzun Hughes, a painter and photographer. Smokers will enjoy the selection of hand-rolled cigars at Milan Tobacconists, founded in 1912, but even if you’re tobacco-free, you can browse the pipes, from ornate Meerschaums to corn cob pipes with cartoon characters. Close by, artist Betty Branch has been creating sculpture for more than 30 years. 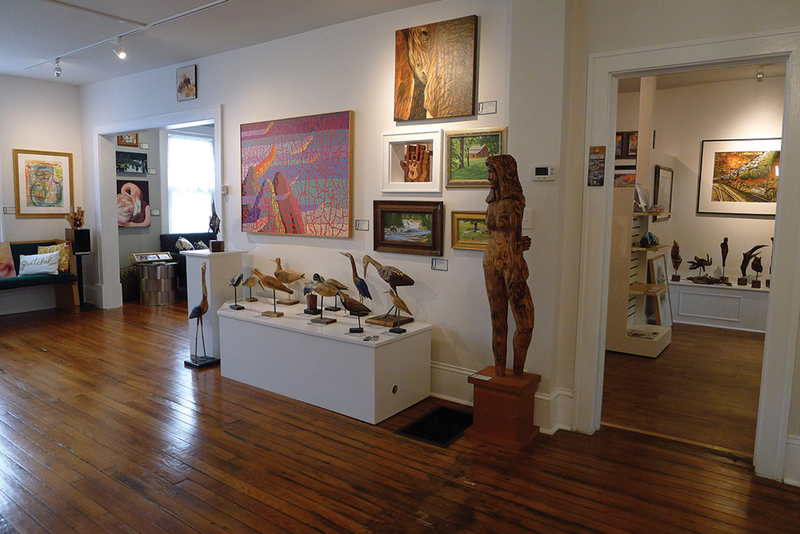 Her warehouse gallery features her work, as well as art by local makers, including her children; it is open by appointment daily. Take in the area’s beauty and the fine craftsmanship its makers are known for along its mountain roads. The White Lightning Artisan Trail, named after the homemade corn whiskey the region is notorious for, offers a delightful sampling of some of the region’s best craft studios and galleries. Some, such as CM Handwovens, run by Carolyn Moore, are in the artist’s home and can be visited by appointment. 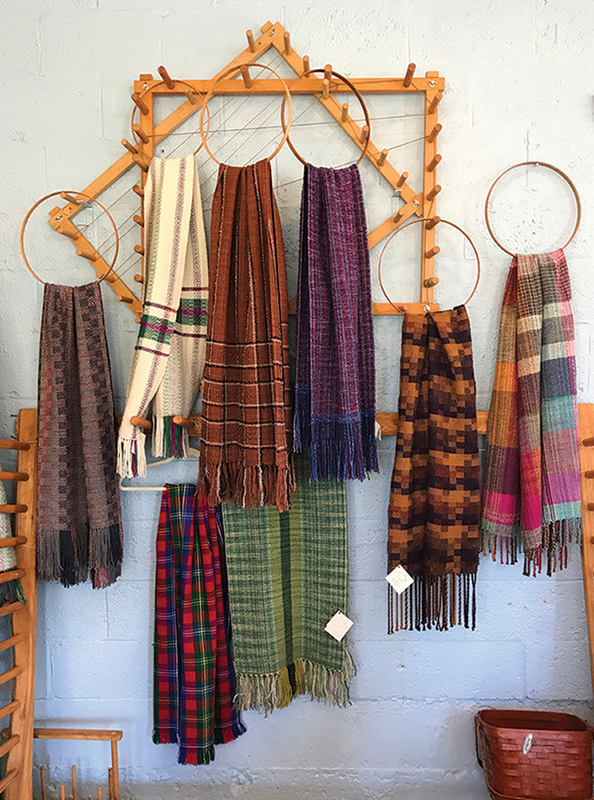 Others, such as Toft Cottage Weavery, where Patricia Rushmore hosts classes and uses a 200-year-old barn loom to weave historical patterns in rugs, scarves, and other textiles, are located in studio galleries nestled in quaint towns. A number of new spaces are opening up, too. Inkular Gallery stands out, thanks to the bright school bus covered in murals parked outside. The farmhouse-turned-gallery hosts events and sells work by emerging local and regional artists, including kids. Head south of Roanoke to visit the alpacas of Pacabella Farm. The working farm has a shop that sells clothing, toys, and spa goods, many of the latter produced on-site. Stop at Boone’s Country Store along the way for baked goods, honey, and local eggs, as well as handmade items such as quilts and baby gear. A half-hour southeast is the Blue Ridge Institute & Museum, where you can see what life was like on a farmstead in 1800; exhibitions and archives offer insight into regional folkways. Heading northeast, Rocky Mount is a small historic town brimming with craft. There, 30-year-old glassworker Carolyn Rogers runs Hot Taffy Glass. Her shop and studio offer glassblowing, flameworking, and kiln fusing classes, along with an assortment of affordable wares and jewelry. Just down the street, the Artisan Center Along the Crooked Road features a little bit of everything: pottery, leather goods, jewelry, glass, books, antiques, and food. Wood Grains American Furniture sells heirloom wood furniture made by Ohio Amish and local craftsmen. 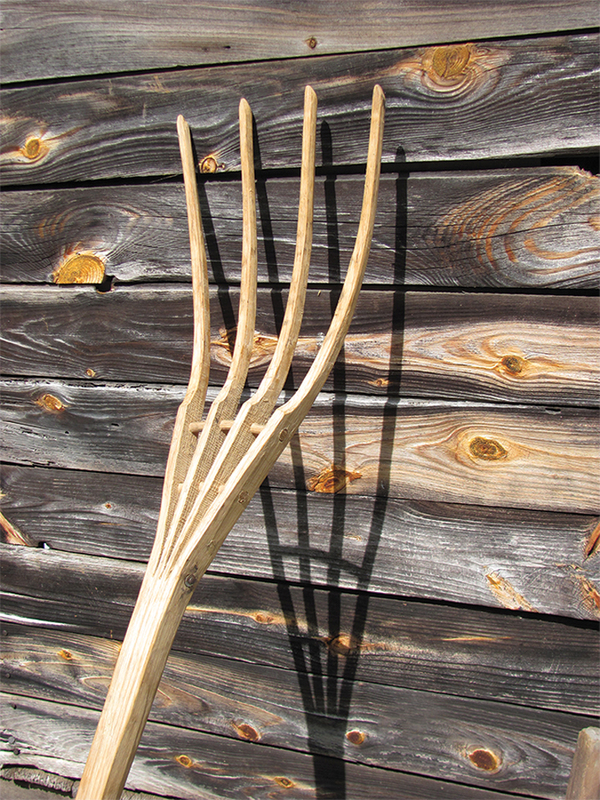 If you’re planning a trip north of Roanoke, email Appalachian craftsman Kevin Riddle. The woodworker and coppersmith offers demonstrations of traditional Appalachian crafts interspersed with lessons on Appalachian history and culture. His wares are also for sale – just be sure to plan ahead so he has the time to make them. 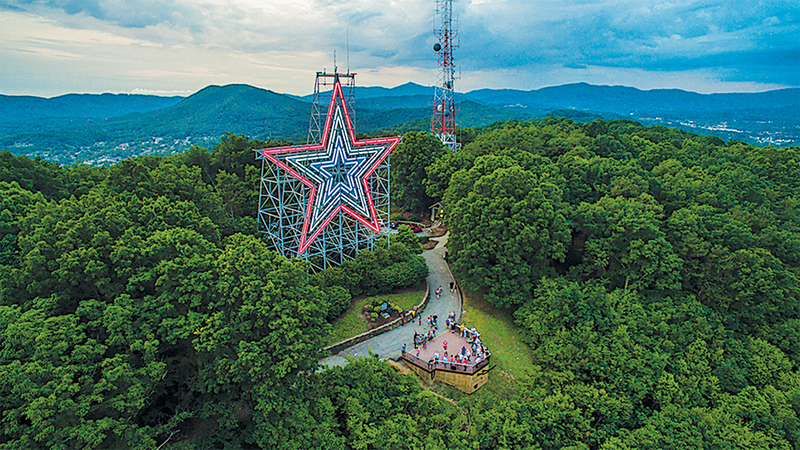 The Roanoke Star, the city’s best-known landmark, glows atop Mill Mountain. 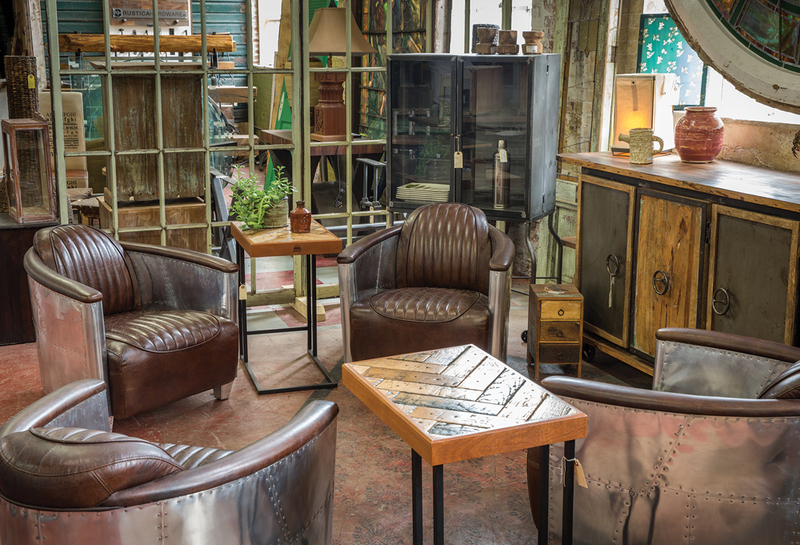 The sprawling Black Dog Salvage showroom features upcycled wares made of elements saved from homes and buildings facing demolition. 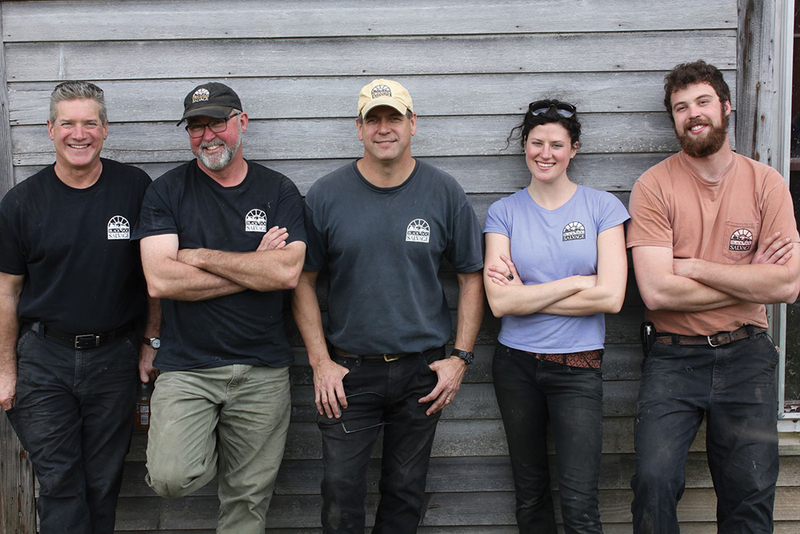 The Black Dog team’s hit TV show, Salvage Dawgs, inspires DIYers to do the same. In the show, they travel around the US rescuing architectural treasures, then return to their workshop to make unique items with their finds. 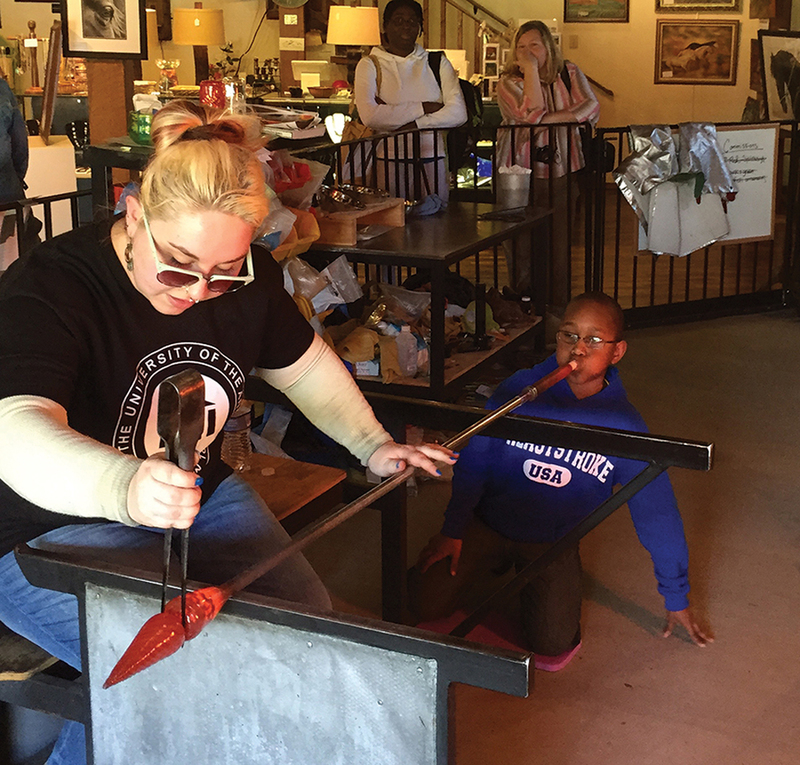 Carolyn Rogers sells her wares and teaches glassworking at Hot Taffy Glass in Rocky Mount. At her cozy studio gallery, Toft Cottage Weavery, Patricia Rushmore weaves scarves and rugs and offers classes. 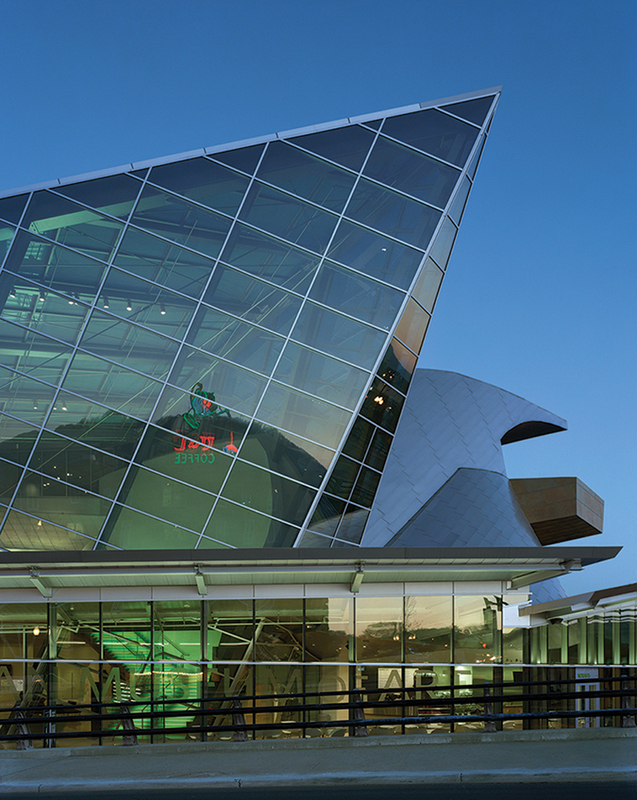 The Taubman Museum of Art’s roofline echoes the mountains surrounding Roanoke. Inkular Gallery, in a former farmhouse, shows work by regional and local artists. 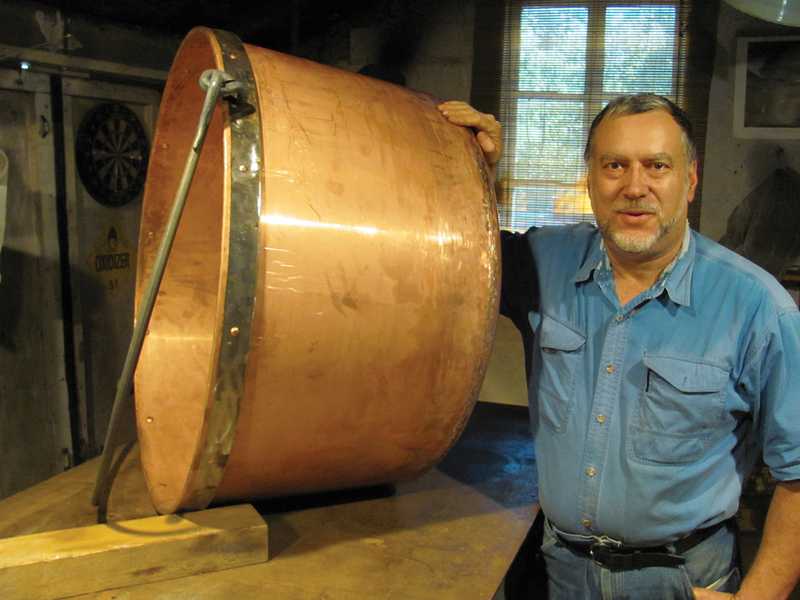 Kevin Riddle with a 40-gallon copper kettle he made. Also a woodworker, he’s been learning Appalachian folk crafts as they’ve been practiced for generations. He often seeks advice from a local network of seasoned craftsmen, then writes down what they tell him for posterity “because I know it’s going to be lost,” he says. The Salvage Dawgs crew (from left): Ted Ayers, founders Mike Whiteside and Robert Kulp, Grayson Goldsmith, and Tay Whiteside (Mike’s son).